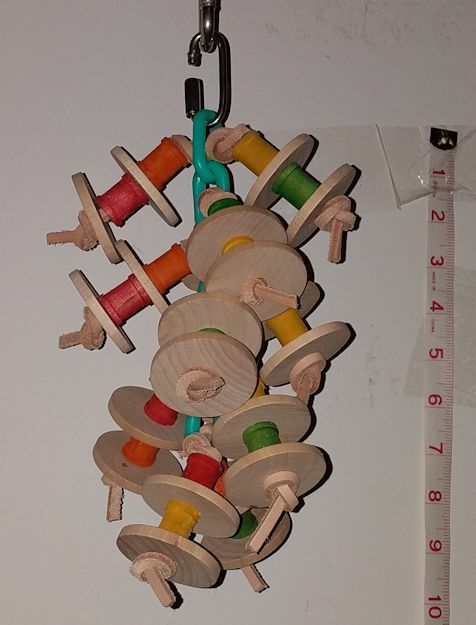 24 1-3/4" wooden discs hang with 24 colorful wooden spools on veggie tanned leather from plastic chain (1-1/2") -- standard with stainless steel quicklink. 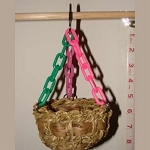 Your birds will chew for hours on end! Very sturdy item. I have 14 cockatiels. By the time all is said and done, all will have a go at this . . . it has been hanging for two weeks and is holding up. It is compact yet gives them a lot to do. I'm very pleased with this toy.